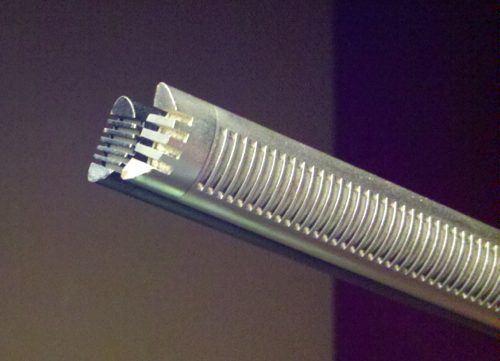 The long tube with slots on the sides visually distinguishes the shotgun microphone from others. Designed to be more directional than conventional microphones, how does that long cylinder with notches increase the ratio of on-axis to off-axis sound? In the 1950s Harry Olson (of RCA 44 mic fame) created a microphone system that used a series of parallel tubes to improve directionality. The operating principle is frequency cancellation by difference in timing. Any time you take the same signal, delay and recombine it, there is a cancellation. The greater the timing delay, the lower the frequency that is cancelled. 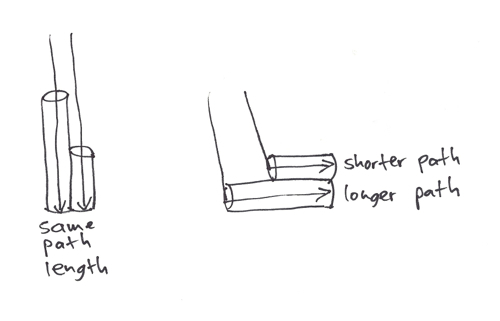 Below we see a simple illustration with only two tubes, one longer than the other. The sound arriving at a common mic element ON axis will have the same path length. In other words sound arrives at the element through both tubes at the same time. But at an angle the tube length delays sound through the longer tube. When they combine, there is a cancellation at a certain frequency. So the path length difference cancels some off-axis sound but the on-axis arrives intact. Olsen used a series of tubes to cancel a significant portion of the spectrum, which made his system more directional than it would have been otherwise. The more tubes you have, the more off-axis frequencies you can cancel, the more directional the system. But at some point the tubes take up too much space to be practical. So the next big development was to use ONE tube with ports in the side. Each port behaves somewhat like a single tube, changing the timing of sound arriving off-axis. A barrel with many ports front to back can cancel many different frequencies. Given the historical development of shotgun microphones, we better understand why they are also known as Line Array (many tubes arrayed on a parallel line) and Interference Tube (many slots cancelling down a single tube) microphones. How do different shotgun microphones sound? Listen to the Shotgun Mic Test at recordinghacks.com to hear microphones by Sennhesier, Neumann and Rode. How long a tube is needed to cancel the entire audible spectrum? Elecro-Voice made the 7 foot long Model 643, designed to cancel as low as 700 Hz. I don’t know about you, but a 7 foot mic nicknamed “bazooka” isn’t something I’ll be carrying in my gig bag. So the truth of the matter is that shotgun mikes only improve directionality at high frequencies (unless impractically long). Thus low pitched Harley drive by noise will not tend to be suppressed by using a shotgun mic any more than by using an ordinary mic with the same first order polar pattern. Combining sound with a delayed version to cancel a frequency is also known as Comb Filtering. The null frequency will be notched but it does not cancel all sound perfectly. While the series of frequency cuts produced by the slots in the tube is sure to improve the ratio of on-axis to off-axis sound, it may not sound very natural. To put it another way, there is often a sonic trade-off in quality for improved directionality with shotgun microphones. Shotgun mikes are sometimes described as sounding “phasey” off-axis because of the comb filtering. Now that you know more about how a shotgun mic works you will be better able to decide when one might be appropriate to use versus trying another solution. 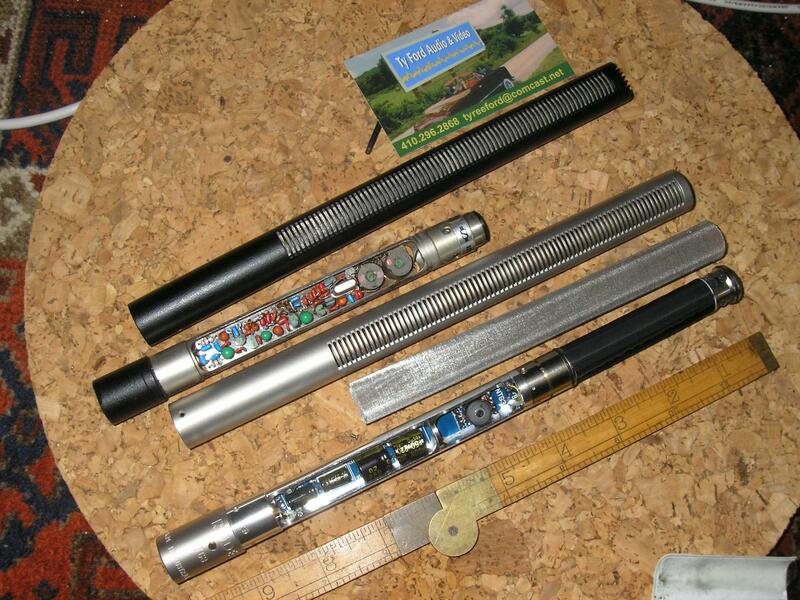 “When is an interference tube not an interference tube? The Sanken CS-3e LOOKS like an interference tube mic, and it is….sort of, but unlike traditional interference tube mics, the main capsule is at the tip of the mic and not halfway down the tube or more. Instead there are other capsules below the Sanken CS-3e tip that help it be more directional. As such, the CS-3e does not behave like a traditional interference tube mic with one capsule halfway down the tube. Ever been inside an interference tube mic? Below is a Sennheiser 416 and Sennheiser NTG-3 out of their skins for everyone to see. The capsule ends up being about halfway down the slotted tube. Great info Francisco. Thanks for the link. Yeah, that would be my picture, shot in my studio. Excellent article, thank you, I’d always wondered how shotgun mics where supposed to work, and it’s interesting to learn that the noise cancelling may be far from perfect. I’m in the market for a shotgun mic all the same, to see if it can help me at all with noisy location recordings, I’ve been having a look at this AKG shotgun mic: http://hblstore.co.uk/akg-shotgun-microphone-c747-vii.html and was wondering if anyone has any experience with it?